Just started this last night. I’ve already ripped out most of that right eyebrow — didn’t see that divot on the inside corner until I was looking at the photo. Taking progress pictures of my projects is really useful that way. Often times I’ll make a mistake or have some weird thing that I don’t even see when I’m looking right at it, but once it’s up on the screen it’s obvious. 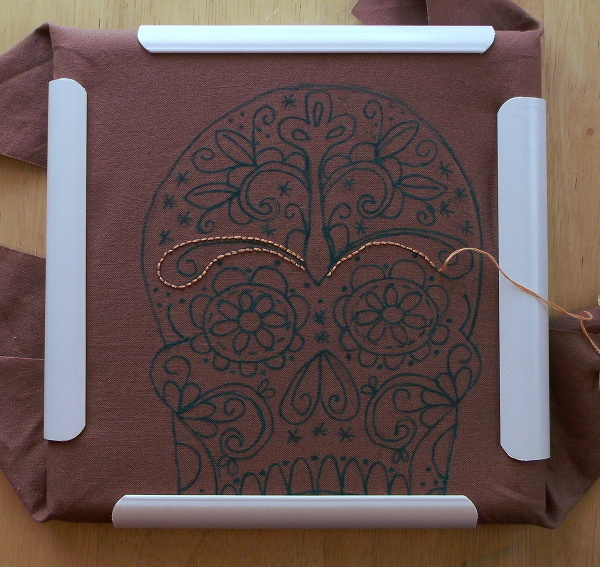 I bought this pattern a few months ago (Calavera from Polka & Bloom) on general principles because it’s amazing, but I had no idea what I wanted to make with it until yesterday. My favorite couch pillow is getting a little raggedy and needs a new cover, and I decided this would be perfect. There will be a few marigolds sprinkled around the skull in the end. Oh I love this. I can’t wait to see it finished. I love the Day of the Dead skills I’ve seen. Really beautiful. This will be stunning done up in colourful threads.